De Hilster on "The Ten Assumptions of Science" and his overview of "Infinite Universe Theory" and his hour-long interview with me on YouTube. The web site of the Progressive Science Institute, an organization that sponsors education and research on scientific philosophy free of political and religious influence. Our no-nonsense books eschew today's strange ideas hypothesizing more than three dimensions and a universe that explodes out of nothing. The black and white paperback is now available for $19.95. The color paperback is available for $49.95. You also can get the eBook for an extra $2.99. Infinite Universe Theory presents the ultimate alternative to the Big Bang Theory and the common assumption that the universe had an origin. Author Glenn Borchardt starts with photos of the “elderly” galaxies at the observational edge of the universe. These contradict the current belief that the universe should have increasingly younger objects as we view greater distances. He restates the fundamental assumptions that must underlie the new paradigm. Notably, by assuming infinity he is able to adapt classical mechanics to “neomechanics” and its insistence that phenomena are strictly the result of matter in motion. He shows in detail how misinterpretations of relativity have aided current flights of fancy more in tune with religion than science. This is the book for you if you have doubts about the universe exploding out of nothing and expanding in all directions at once, that the universe has more than three dimensions, or that light is a massless wave-particle that defies the Second Law of Thermodynamics. Borchardt has put forth a solid case for an Infinite Universe that extends in all directions and exists everywhere and for all time. Keep up with our progress ridding the universe of the Big Bang Theory by joining our email list. Benefits include updates on Blog entries, podcasts, videos on our forthcoming YouTube channel, and the availability of various freebies including free books and a planned audio file of "Infinite Universe Theory." You too can be part of the last Cosmological Revolution. Just subscribe by clicking here. The universe is infinite; the motions of matter are predominantly cyclical. These simple statements hold huge implications about how the universe must operate if it was truly infinite rather than finite, as is commonly thought. 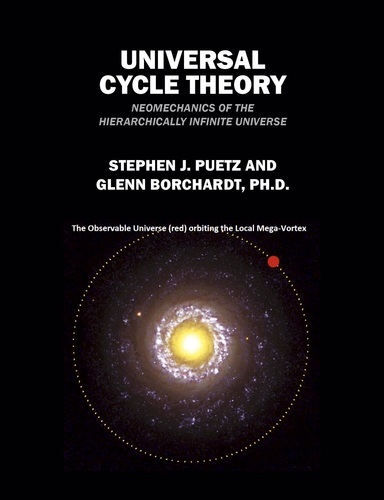 In one sense, this book, Universal Cycle Theory, may seem radical because it postulates that the universe operates in ways that are dramatically different from what we are taught. Yet, this new theory is conventional in the sense that it closely conforms to virtually all existing laws, equations, and observations. There are only two elements that make the Universal Cycle Theory radical – cycles and infinity. Other than that, much of what you read in this book will seem familiar and conventional. Cycles are crucial because they are reflections of how matter behaves in an infinite universe: as vortices and waves. A vortex forms when matter rotates, producing circular cycles. A wave forms when colliding matter compresses and decompresses, producing linear cycles. 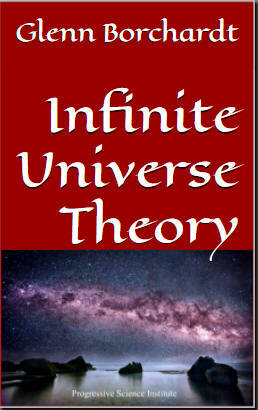 Infinity is crucial because it explains the extent and structure of the universe. We assume that matter is infinitely divisible in the microscopic direction and infinitely integrable in the macroscopic direction. We assume that time was infinite in the past and will be infinite in the future. This concept of infinity is unique, having never been employed in a model of the universe before. It resolves many of the paradoxes and contradictions currently riddling physics and cosmology. Steve Puetz, a mathematician and statistician, wrote The Unified Cycle Theory (2009), a landmark book announcing the discovery of a seemingly infinite set of cycles, now dubbed the UWS cycles. This was just enough evidence for the two authors to begin the great collaborative effort that resulted in this book. Steve provided the research and developed most of the ideas for the book. 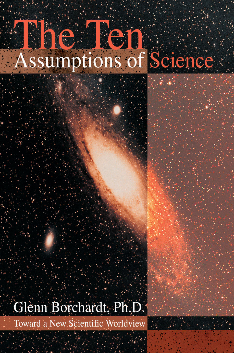 Glenn Borchardt, a scientific philosopher, initially developed the infinite universe theory--detailing its foundation in The Ten Assumptions of Science in 2004. In The Scientific Worldview (2007), Borchardt introduced the universal mechanism of evolution and neomechanics, which adapts classical mechanics to infinity. Glenn provided the philosophical and editorial guidance for the book. The Scientific Worldview presents a balanced theoretical perspective that has profound implications for the social and physical sciences. Author Glenn Borchardt outlines the philosophical alternatives and those necessary for consistent scientific thinking. The balanced outlook requires beginning assumptions alien to classical mechanism and modern systems philosophy. The central concept of the resulting philosophical system is univironmental determinism—a new universal mechanism of evolution founded on the simple proposition that whatever happens to a thing is a result of the infinite variety of matter in motion within and without. Borchardt argues that the biased outlook of the twentieth century “scientific worldview,” systems philosophy, which overemphasizes systems and neglects environments, taints our most fundamental theories about the universe. But with the philosophy of univironmental determinism, we can gain the feeling of control in our lives and achieve a newfound level of consciousness through which we will change the world for the betterment of all. Buy the audiobook online now! Buy the book online from iUniverse or Amazon now! The Ten Assumptions of Science presents the logically coherent set of assumptions destined to define 21st century scientific philosophy. Glenn Borchardt first explains why assumptions and not absolutes are necessary for scientific thinking. By exploring the opposition between deterministic and indeterministic views, he clearly shows how critical choices among underlying assumptions either clarify or muddle scientific analysis. He shows how customary mixtures of deterministic and indeterministic assumptions are responsible for the current confusion in modern physics. According to Dr. Borchardt, only rare physicists and philosophers have an inkling of the nature of time, space, energy, and matter. The need for reassessing our fundamental assumptions is indicated by the present sorry state of cosmology. Otherwise intelligent scientists promulgate the idea that the universe expanded from a tiny "singularity" smaller than the period at the end of this sentence. At the very least, adherence to Borchardt’s assumptions will contribute to the rejection of the "Big Bang Theory," which has surpassed the flat Earth theory as the greatest embarrassment to serious thinkers everywhere. Although the book makes an excellent supplement to college courses in scientific philosophy, it is an astounding eye-opener for the educated reader with an interest in science and philosophy. Copyright © 2004-2019 Glenn Borchardt. All rights reserved.